Meeks Park is one of Blairsville's greatest treaures, with a myriad of activites for everyone in the family. 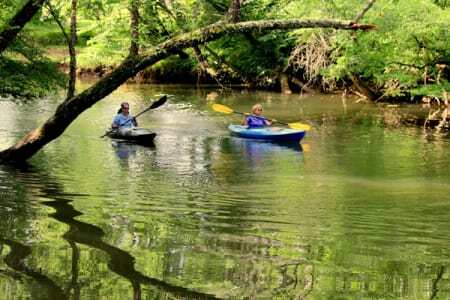 Butternut Creek and Nottley River both wind through this pristine park located just one mile from downtown Blairsville. With a gorgeous mountain backdrop, Meeks Park's scenic shade trees line nature trails, both paved and unpaved, for visitors to enjoy. Water lovers have a multitude of activities to choose from including a kayaking and canoe launch, seasonal swimming pool and splash pad, fishing, and more. Meeks Park features athletic fields and courts including tennis courts, 4 baseball fields, 2 softball fields, batting cages, a t-ball field and a utility field that can host an array of activities. Disc golf, dog park, skateboard park, a playground, outdoor gym, picnic tables and pavillions that can be reserved for events, are all part of this amazing park which has often been referred to as the best park in North Georgia. This park is a must see for visitors, and make a great spot for a picnic or outing with family or friends. Be sure to check out the sculpture by famed artist and local resident Al Garnto. Click Here for map.